2018 PSE Mini burner compound bow kit Archery Supplies Australia's largest and Best Archery Equipment warehouse. Please Select 19" 20" 21" 22" 23" 23.5" 24" 24.5" 25" 25.5" 26" 26.5"
The 2018 PSE Mini Burner is a kit that includes some other equipment, such as, a 6" stabilizer, 3 Pin Sight, an Arrow Rest, a bow quiver, and 3 Carbon Arrows. These will help to make your child have the most memorable experience when shooting. The 6" stabilizer is a common stabilizer to which it helps to balance out the bow when shooting, which helps with the degree of accuracy. short so it doesn't get in the way of anything and cannot knock anything down if a child is to swing the bow around for any reason. It is also short so that a child can easily take it off. The 3 Carbon Arrows that is given with the bows are quite common to have in today's society. It has a 'plastic-like' material which is still a tough material so it does not break when it hits a target. It has a smooth outer layer which is coloured black. The 3 arrows that are already given to you have 3" veins that are coloured 2 green, and 1 yellow. These 3 arrows also already have knocks on them which is coloured green. The Carbon Arrows have screw in arrow points already ready to be used. To have the 2018 PSE Mini Burner kit, you can be either left or right handed, you will just need to pick what hand you use the most. The 2018 PSE Mini Burner bow kit weighs around 2.7LBS, with the draw weight being either 29#, or 40#. This draw weight can be adjusted from 8 to 29LBS. The 2018 PSE Mini Burner has a draw length of 25" which can be easily adjusted to fit your needs. The draw length range differs from 16" to 26.5" to suit the shooter's needs. This bow, the 2018 PSE Mini Burner, is a bow ages 5 and above. This is because a bow for anyone younger could be very dangerous. The child may not be able to hold it or pull it back, and may not know what to do with it meaning that an arrow could be shot in any direction if the child has not had any training. The 3 pin sight included on the bow is a useful sight to which it also includes a level. This all helps to have an improved accuracy in shooting. Each of these pins used in the sight is differed by the distance that you are at. The 2018 PSE Mini Burner bow can come in 3 different colours. The colours that you can choose from is black, lime green, and a mossy oak country colour. All three of these colours express the shooter more, and give different expressions to the bow. The black bow, you can see it has a more matte black colour on the limbs, whereas, it has a shiny black colour on the riser. These types of details depend on the colour that you actually pick because each of them are different. The 2018 PSE Mini Burner bow utilises a quick grip acquisition technology to which it is small, and easy for a young child. The 2018 PSE Mini Burner bow shoots up to 185 Feet Per Second, which is perfect for a young child. This bow kit, the 2018 PSE Mini Burner, is the perfect kit for beginners and young children with moments that no kid can forget about. 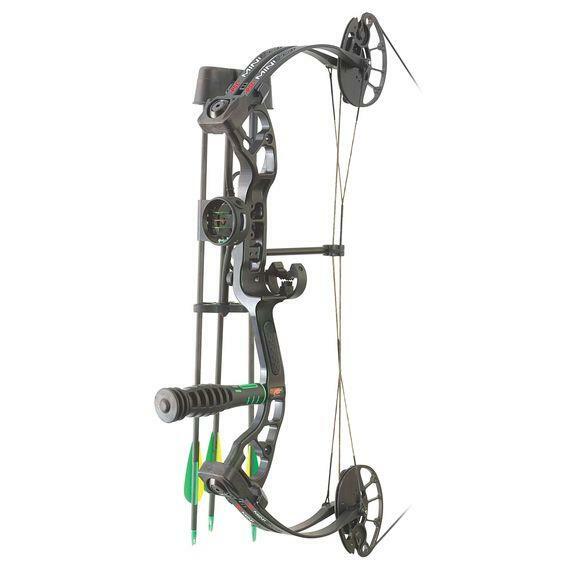 Draw length range 16"- 26.5"
Hi can you tell me what material the bow is made of? Riser is metal, limbs are fiberglass, cams are metal.